Our crowdfunding campaign has ended, but you can still support the Gage Gavin Memorial PGA Golf Management Endowed Scholarship by clicking here. 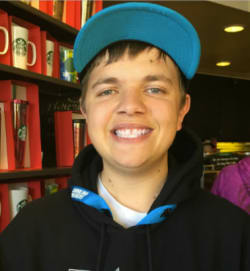 On June 22, 2015, the unthinkable happened, Gage passed in his sleep due to a seizure at the age of 18. I had always heard, how devastating it was to lose a child, a sibling, a nephew, a grandchild. Our entire family never thought that it “could happen to us”. Well it did, and it is the worst thing you could ever imagine. Why Gage? He was the most caring, honest, and loving person I have ever known. He was my best friend and son. Everything was great, loving family and he had just recently reached his lifelong goal of graduating from Onate High School in May. He wanted so much to work alongside me in the golf industry, he was making plans to work at Sonoma Ranch Golf Course. Over the past ten years he was very active in hanging around with my PGA Golf Management students and alumni. Everyone knew Gage and loved to be around him. He established very tight friendships with many of them. My daughter Courtney Gavin is currently in her fourth year of Pharmacy school, where she is pursuing her Doctorate of Pharmacy. She recently explained why she selected that field of study, simply put to “try to understand and help families that deal with seizures and other medical illnesses. Last year we created an endowment to not only remember Gage and have his name and memory live on, but also to help current PGA Golf Management students with the financial burden of college. Help as many students as possible by continuing to grow this endowment. This year, with the help of the NMSU Foundation Office, we have a goal of raising $10,000 to add to Gage’s endowment. Every dollar donated will go directly to the NMSU Foundation office, where it will be placed into this endowment. I personally will cover any stewardship fees associated with any gifts of $1,000 or higher. Again, this is our way to pay tribute and help Gage’s name and great memories live on forever. This endowment with help several students every year, including, but not limited to, PGA Golf management students with learning disabilities. On behalf of the entire Gavin family and the PGA Golf Management family (over 25 years and stronger than ever), thank you for reading this and considering to help fund this endowment. Your gift of $5 will help a student today. Your gift of $25 will help a student today. Your gift of $50 will help a student today. Your gift of $100 will help a student today. Your gift of $250 will help a student today. Your gift of $500 will help a student today. Your gift of $1,000 will help a student today.